So my husband was off to the fish markets one Sunday morning and I asked him to get a few cooked prawns. He bought some fish that we had for lunch, but then I was full so the prawns were left for the following day. For the last few weeks any new recipe I try must come from one cookbook, I use the same cookbook all week, then change cookbooks. This week it was Bill Granger week. In his cookbook he made lobster sandwiches. Now I love lobster, but I'm not sure I want to put it into a sandwich, I'd come up with something a little more exciting than a sandwich when using lobster. 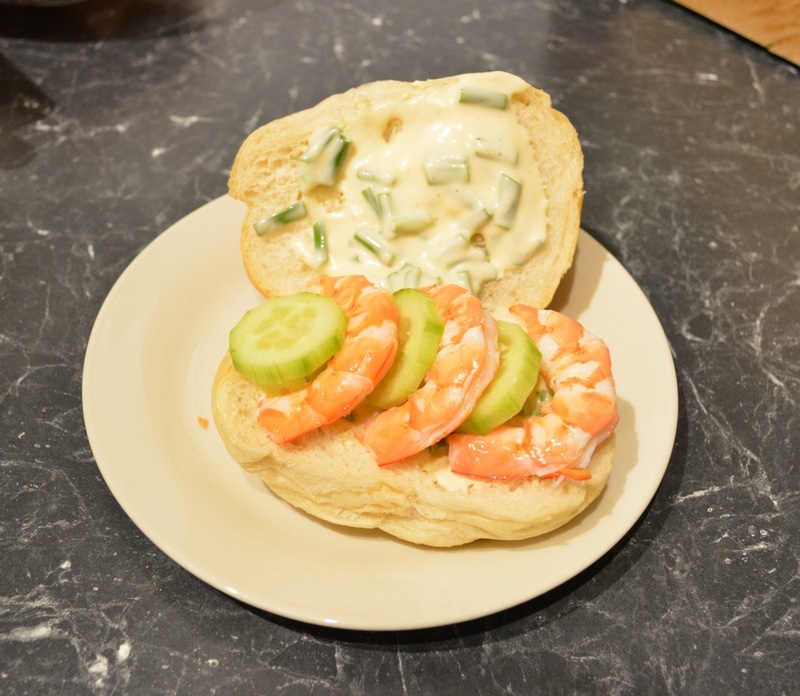 But as I had prawns, I thought that they would work perfectly in this sandwich. And they did, this sandwich is so delicious, honestly after I had the first bite, it was an OMG moment, it was divine. The mayonnaise is so easy to make, a bit of store bought mayonnaise (I only use Thomy mayonnaise, and I'm not paid to say that, it is just the only mayonnaise I love) mixed with a few other ingredients and wow it is delicious. And as for cucumbers, how a simple cucumber makes a sandwich amazing, I absolutely love cucumbers in sandwiches. 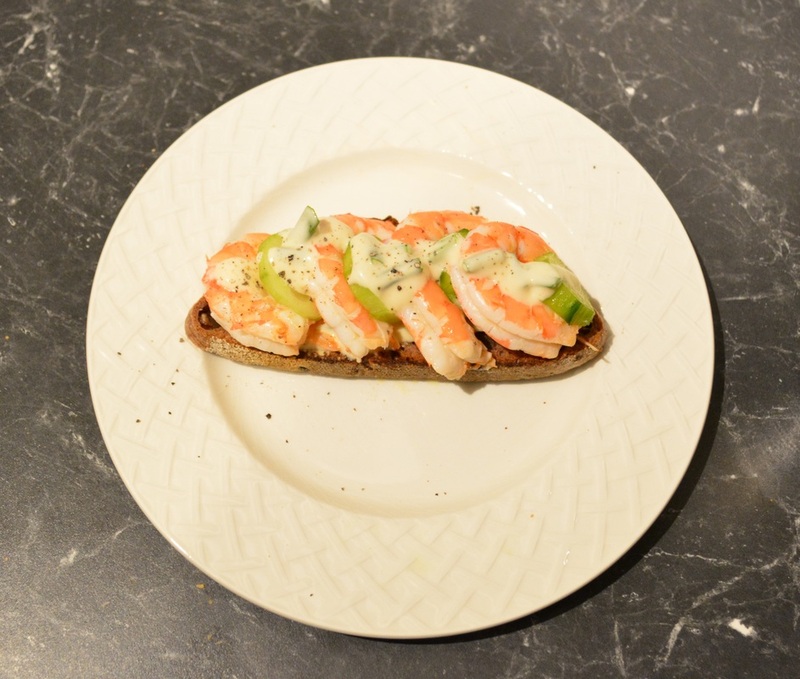 For my son I used the white roll above as he loves that, but I preferred the open sandwich on rye bread below. So use whatever bread you love to make a sandwich that is so good, you'll want another. One day I'll try this with lobster, but for now the prawn will do, it tastes great and it is cheaper. 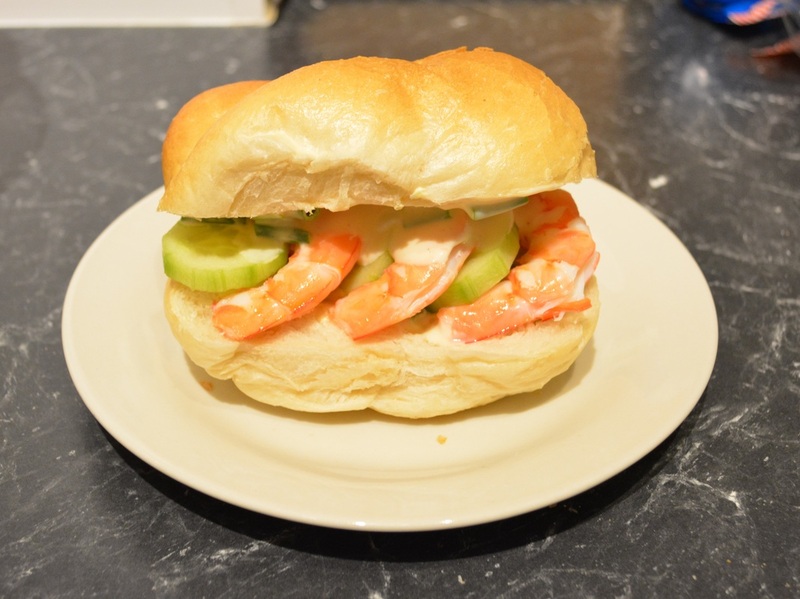 So if you are off to a picnic one day, or if you have a few prawns that need to be used up, make this sandwich, it is so good, every bite will be loved. I'm even thinking if I slice up a breadstick thinly, this could work as finger food with drinks at my next party or barbecue. Cut the bread rolls in half lengthways, leaving them attached along one side. Spread both halves with a little butter. Make the chive mayonnaise: Mix the mayonnaise with the remaining ingredients, season well with salt and pepper. Spread a layer over the bottom half of each roll (you can add it to the top layer if you like as well), then top with alternating pieces of prawn and cucumber. Serve immediately or wrap up in cling film and keep chilled until needed, if taking on a picnic.